Thinking about chocolate? Looks like it is on my mind for sure considering the last couple of recipes had something to do with chocolate. I do like chocolates but ever since I am eating right and working out, my cravings have gone down a bit. More on it some other day. 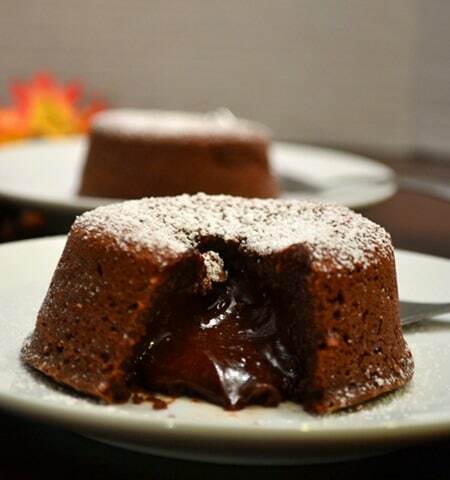 Coming back to this recipe, this Molten Lava Cake is amazing – it takes all of 20 minutes to make + it will surely satisfy your fill for chocolate for the week. 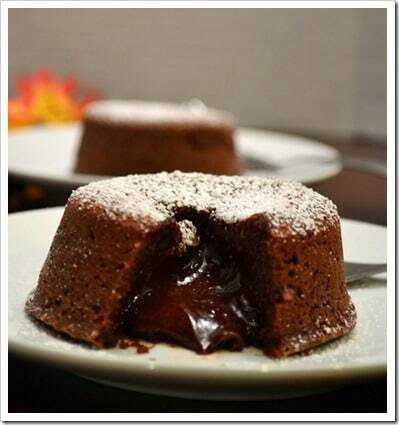 The minute you cut it open, lava of chocolate oozes out and you are in chocolate heaven. YUM! My only regret – I did not get better pictures! A few notes before you get started. This is a good make ahead recipe – Get the batter ready, pour it in ramekins and cover it with a plastic wrap and keep it in the refrigerator the day before and right before your guests come in pop it in the oven. 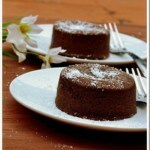 If you make the cake and store in the refrigerator and reheat it again you may not have a Molten Lava Cake. You will still have a chocolate cake you can enjoy. I substituted butter with Canola oil because I could not fathom using 1-1/2 cups of butter for 4 small cakes. Grease ramekins/custard cups and place them on a baking sheet. Microwave chocolate and oil in a large microwaveable bowl for 30 seconds. Whisk it well until chocolate is completely melted. Microwave for an additional 10 seconds if needed to completely melt chocolate. Whisk eggs, egg yolks, and sugar on high till it is well blended. Stir in the flour and chocolate mixture until smooth. Divide the batter into 4 ramekins. Place the ramekins in the oven along with the baking sheet and bake for 13-14 minutes. The cake will firm on the sides but the center will be runny. Let it stand for a minute. 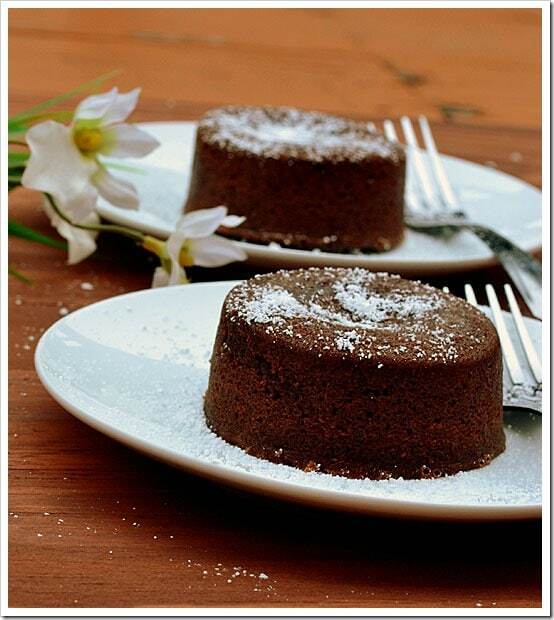 Carefully run small spatula or knife around cakes to loosen and invert onto dessert plates. Dust with confectioners sugar and serve immediately!